Future transfer students toured the Turquoise Mountain exhibition and snapped photos of the artwork. Students gazed at hand-made, turquoise-colored bowls. They stared at a necklace set with Afghan lapiz lazuli stone. And they watched videos featuring Afghan artisans telling their stories. 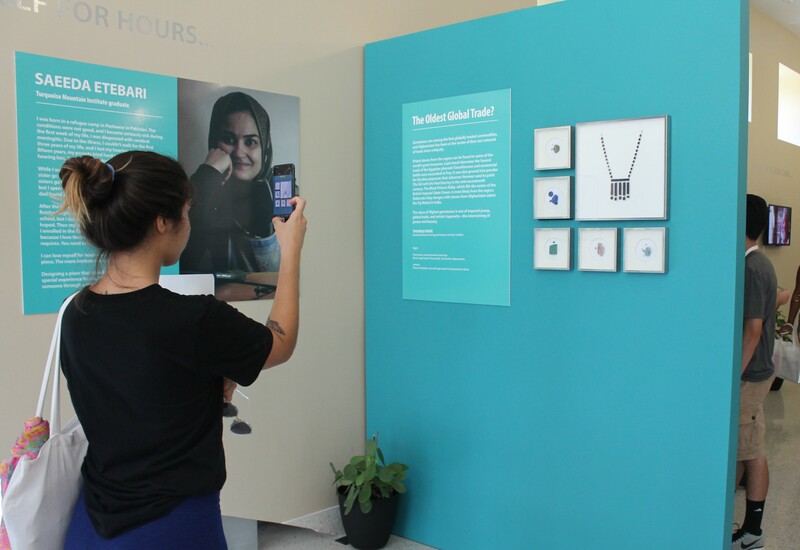 This past summer, 60 students – all from Miami Dade College (MDC), majoring in art, history or English and approaching graduation – experienced the Turquoise Mountain: Artists Transforming Afghanistan exhibition currently on display at the Steven J. Green School of International and Public Affairs’ lobby. The exhibit features traditional Afghan woodwork, ceramics, jewelry and other crafts, along with an immersive documentary video and large-scale photographs of artists who are transforming the city of Kabul through a revival of traditional arts. This exhibit is the first showing of Turquoise Mountain in the United States since it premiered at the Smithsonian Institution’s Freer/Sackler Gallery in Washington, D.C., in 2016. It’s also an incredible display of the power of the humanities. “It’s a fascinating story of sustainable development that emerged through the arts,” says Pedro D. Botta, senior director of strategic initiatives at the Green School, who organized the FIU exhibit. The partnership is the result of an Andrew W. Mellon Foundation three-year, $2.85 million grant to assist approximately 5,000 local students pursuing an education in the humanities every year. Ana Menendez (center), director of The Humanities Edge at FIU, has held a special place in her heart for Afghanistan and its history since she visited the country as a journalist in 1998. 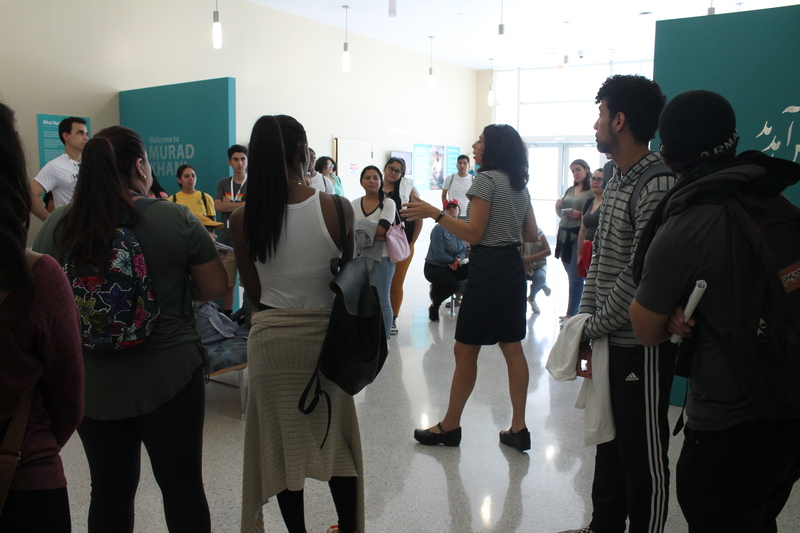 Humanities Edge hosted an intensive, week-long summer program dedicated to exposing MDC students – soon to be FIU students – to Panther territory and to academic and career options in the humanities fields. The students attended discussions by FIU professors focusing on the academic conversations surrounding the humanities; explored career development options; got expert advice from FIU alumni who graduated in their fields; and visited Overtown as well as the HistoryMiami Museum. They also got to explore FIU. During a scavenger hunt, students found their way to campus hot spots like the Graham Center. They checked out the academic departments that house their chosen majors and they stopped by the Green School building. Another great reason to stop by the Green School: Turquoise Mountain offered keen insights into the humanities, says Menendez, who holds a special place in her heart for Afghanistan since visiting the country in 1998 as a journalist. In a day and age in which the humanities are often considered a luxury, Menendez says, the exhibit also points to the value of the humanities – and the relevance of these fields. For more information about the Humanities Edge program, visit its website. And to learn more about Turquoise Mountain, click here.